Most people presumed Cliff Lee would be a good fit for the Mariners when they acquired him this off-season. When an abdomen injury pushed his season back a few weeks, the condition alleviated some of the buzz surrounding him. Lee is five starts into his 2010 season and still people seem to look elsewhere when discussing the best starters to date. That’s a mistake. Not only is Lee pitching well; he’s pitching better than he ever has before. Lee is averaging a little over seven innings per start, which totals 36.2 innings pitched. He’s struck out 32 batters and walked one. That would be a strikeout-to-walk ratio of 32, which is simply unheard of. The best strikeout-to-walk ratio in baseball history (for pitchers with at least 100 innings in a single season) is 11 – posted by Bret Saberhagen in 1994. Ben Sheets‘ 2006 season is the only other case of a double-digit strikeout-to-walk rate for a starting pitcher with at least 100 IP. Aside from Saberhagen and Sheets, Curt Schilling is the only other pitcher to break the 9 K/BB barrier, which is fitting. During Schilling’s later years with the Diamondbacks, ESPN would always joke about whether Schilling’s win total would exceed his walk total. Now, Schilling never actually accomplished the feat, but Lee very well could. In fact, Lee actually has more wins (two) than walks at this moment – and given his performance to date, should have more wins, if not for lousy run support and other factors beyond his control. Also, Lee has yet to allow a home run. That tidbit, combined with the walks and strikeouts, make his 3.44 ERA look absurdly high. Lee’s batting average on balls in play (BABIP) allowed is .341. That’s well above league average around .300 as well as his career norms, and should regress given that he’s supported by one of the best defenses in baseball, in a park that suits left-handed pitchers very well. Lee’s FIP – which takes defense out of the equation – is a microscopic 1.44. His xFIP – which normalizes home run rates (i.e. attempts to strip out even more luck) – is a still excellent 2.93. Lee’s Cy Young winning xFIP was 3.57. Last year it was 3.69. He’s about a half run per nine innings better than when he was considered one of the best pitchers in baseball. Now, don’t expect Lee to pitch quite this well all season; history tells us his walk and home run totals can’t stay this low forever. But he’s still a true elite pitcher, and can reasonably be mentioned in the same breath as Roy Halladay, Tim Lincecum, Ubaldo Jimenez and other star hurlers. Unless the plan is to ship him away for future help in deep keeper leagues, there’s no reason to trade or bench Lee. Instead, appreciate how great he really is. Oh, and give kudos to the only batter Lee walked this year: Evan Longoria. 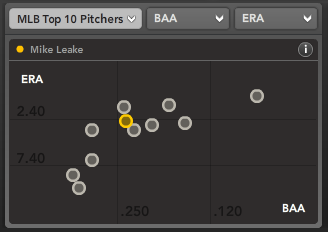 For more on Cliff Lee and other aces, check out Bloomberg Sports’ Fantasy Tools. Is it Time to Dump Chone Figgins? When the Seattle Mariners signed the speedy Chone Figgins to a four-year deal over the off-season, a .193 batting average and eight stolen bases is not what they envisioned. Yet, to date, Figgins has produced just that total and looks hapless at the plate, leading some to wonder whether the Los Angeles Angels of Anaheim knew what they were doing when they let Figgins walk. While the Angels almost certainly held intimate knowledge of Figgins, even the most pessimistic account of his aging patterns would be hard-pressed to forecast his strikeout rate jumping from the teens to more than a quarter of his at-bats. Data provided by FanGraphs has Figgins’ contact rate at a career-low 80.9%, whereas in recent seasons Figgins has made contact at an 86% rate. That is concerning, but the good news is that Figgins is still drawing walks. What about that batting average though? Figgins’ batting average on balls in play is a measly .250. His career rate is 88 points higher; over the last three seasons, Figgins’ low is .356. Using batted ball data to dissect his game, Figgins is hitting as many grounders as ever, but fewer liners than usual. Behold though, the one real caveat about batted ball data in general: Line drive percentage. Since human scorers tally what is a fly ball and what is a line drive, there are discrepancies year-to-year and park-to-park. A quick glance at previous years shows that the Angels’ scorer might take some liberties in qualifying close fly/liner cases as line drives rather than fly balls. Figgins’ struggles are exacerbated by circumstance. In April of 2009, Figgins hit .244 with an inflated strikeout rate and wound up fine. In September and October of 2008, Figgins hit .234. In 2007, Figgins hit .250 in April and then .156 in May. He then torched the league for a .461 average in June, .351 in July, and .342 in August. Those months are only cherry-picked in the sense that the following results are known. The expectations for Figgins’ season outlook have certainly depressed, but at the same time, presuming that Figgins cannot hit for the Mariners when five weeks ago everyone thought he would makes no sense. It’s that fly-by-the-seat style of roster management that leaves notoriously slow starters ripe for the grabbing come this time of the year. If you own Figgins, hold onto him. If someone in your league dropped him, run to the waiver wire and take advantage of your competition’s short-sightedness. For more on Chone Figgins and other struggling players, check out Bloomberg Sports’ Fantasy Tools. Every year a handful of young pitchers will ascend the ranks, have a hot start, and cause a scramble to the fantasy waiver wire. Two of these early-season stories couldn’t be more contrasting in background and how they get the job done. Doug Fister is a large human being. He stands six-foot-eight and most of that height is made up by lengthy stubs he uses as legs. 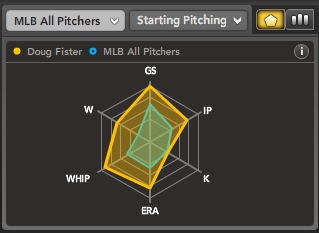 Fister spent most of 2009 in Triple-A and showed impeccable command while getting outs via groundballs. Seattle placed him in their rotation late in the season and he continued those ways while giving up a few too many longballs. He still held a 4.13 ERA though. Mike Leake has never thrown a pitch in the minor leagues. The Cincinnati Reds drafted the six-foot-nothing righty out of Arizona State University last June. The only pitches he threw for them thereafter came in the Arizona Fall League and during spring training. That didn’t prevent Leake from winning a job with the big league team this season, and so far the results have looked pretty good. Thanks to a Cliff Lee injury, Fister began the season in the Mariners’ rotation. Not only has he made three starts while lasting an average of six innings per, he’s allowed only three runs and 12 hits. He’s still not striking anyone out, but he doesn’t have to right now because he’s not handing out free passes or home runs. Even when his ERA regresses upwards – and it will – he could still fit the mold of a Nick Blackburn or – Seattle fans hide your eyes – what the Mariners thought they would be getting when they signed Carlos Silva a few fateful winters ago. With the Mariners’ terrific outfield defense, it could work. In two starts and 13.2 innings, Leake racked up groundballs and avoided home runs, which made him a lot like Fister. Leake had a tougher time in his third start. He still managed to last seven innings, but gave up five earned runs on two home runs. Five strikeouts, a walk, and 16 of 23 balls in play going for groundballs provide some hope that this is an outlier rather than the real package heading forward. Unlike Fister, though, Leake only has a 77% contact rate against, whereas his taller counterpart has a 92% contact rate against. That suggests that while they may take similar steps to getting the same result – groundball outs – Leake has the secondary stuff to also record strikeouts. Particularly his change-up and slider; according to pitch data from pitchfx, Leake’s change-up is being swung at and missed 18% of the time and his slider is being missed 19% of the time. Those are fantastic rates for any pitcher, especially for a rookie without a minor league track record. In a vacuum, that potential along with his pedigree make Leake a more attractive fantasy option moving forward. At this point, either are worth adds in deep American- or National League-only environments. Leake might be worth adding in deeper mixed leagues too. 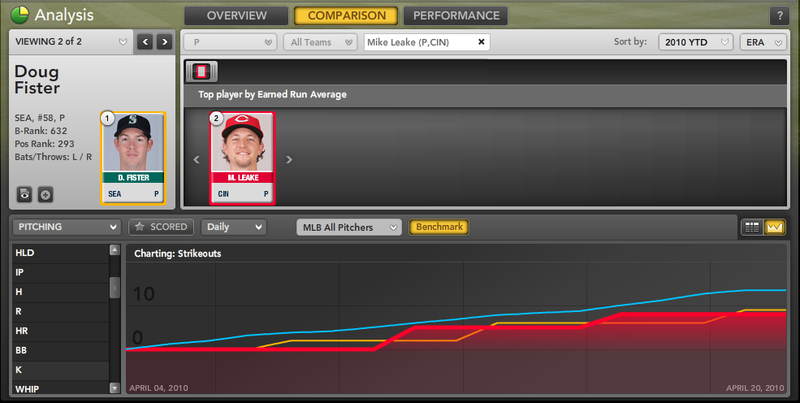 For more on promising young players like Mike Leake, check out Bloomberg Sports Fantasy Tools.